Size: Most ladybugs are 1/4 of an inch long or smaller! Elytra: The most recognizable part of a ladybug is called the elytra. The elytra (plural of elytron) are hard and shell-like and are red with black spots on the species of ladybug we traditionally think of. There are however other colors that a ladybug could be such as orange, yellow, green and even blue! The elytra covers the very delicate wings of the ladybug. Though spot markings may reside on other areas of ladybug anatomy only the ones on elytra are counted. Below are just a few samples of very different appearances of ladybug elytra in difference species. Wings: The ladybug's wings are so thin that you can see right through them. Pronotum: The pronotum is often mistaken as the ladybug's head. It is responsible for protecting the ladybug's very small head, the two white spots (seen on the 7-spotted ladybug images below) on both sides look like eyes, but actually the eyes are on the ladybug's tiny little head. The head on these ladybugs also has two small white spot markings. Ladybugs can actually retract their heads somewhat under the pronotum much in the same way a turtle does, though not as far. In the images below you can observe how a dormant or inactive ladybug can appear more spherical as its head, pronotum and legs are tucked in. The active ladybug has its pronotum, head and legs extended outward giving a more oval body shape. When observing ladybugs at their actual size this can make their markings on the head and pronotum appear different. Antenna: The ladybug also has two antenna used to feel it's way around and to smell and taste things. Legs: Ladybugs have six jointed legs which also have organs that can smell on them! 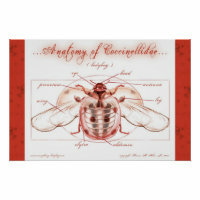 The above ladybug anatomy chart is available as a poster. Great to have for classrooms for anyone who loves ladybugs and wants learn more about their anatomy. Definitely worth a look. In this remarkable ladybug video you get to see the slowed footage of a ladybug in flight. The forewings (known as the elytra) have pulled up, open and forward. The soft underwings which the ladybug actually uses for flight have unfolded and are flapping rapidly back and forth to maintain flight. The ladybugs wings beat at about 85 times per second. If you want you take a really thorough look at ladybug anatomy, you will need to check out the Ladybug Morphology created by the entomologists over at Ladybirds of Australia website. This wonderful flash module will show you all the intricute parts of a ladybug with descriptions about what each part is. Learn some great facts about ladybugs such as what they are, what they eat, where to find them and much more! Ladybugs sure grow up fast. Like other beetles they have complex little lives. Learn the phases of a ladybug's life cycle here! Ladybugs are renowned for their abilities to control a number of pests that eat our plants. Learn the facts about ladybugs & pest control here. Learn how to attract ladybugs to your yard or property the natural way. On this page we have some info how to get these colorful little beauties to start showing up in your garden.